A business editor on a weekly newspaper has proved journalism is a cut-throat profession after putting his neck on the line with a trip a local barber’s shop. 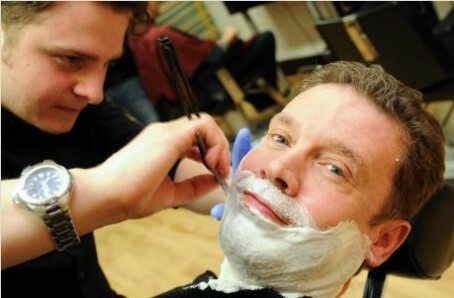 Basingstoke Gazette journalist Richard Garfield was offered a traditional cut-throat shave at Taylor Made Men’s Grooming in Hampshire from barber Luke Ruffell who is competing for a place in the Barber Connect 2014 competition. The 24-year-old hairdresser is up against 14 other barbers from the South East and was happy to give Richard an insight into the process of cut-throat shaving. So having been brave enough to step forward for the feature after a request from his boss, Richard sat down for the closest shave of his life. “Having examined my three day’s worth of growth, he ascertained how he was to tackle my visage, noting that I had a few hair whorls in my beard, much like you would see on the crown of some people’s heads,” he told the paper. “The initial process involved the application of a facial cleaner and the first in a series of hot towels, to open the pores of the skin. Richard was told the shaving process takes off about five or six of around 13 layers of skin. “The shave itself was very smooth, expertly done with gentle swipes, with special attention around my septum and lips. This was followed up with a aftershave balm, a gentle facial massage, and moisturiser,” he added. What’s next week’s headline? ‘Bear sh*ts in wood’?